Women around the globe show that once they hit their 30s, age lines, dark spots, and uneven complexion start to surface on their skin. While global studies show that signs of aging appear at various ages, it is at this age when skincare becomes critical as accumulated exposure to UV light, pollution, and stress have caused their skin to show these signs of aging. Ladies, now is the best time to invest on your skin.as the World’s No.1 Anti-Aging Brand and a trendsetter for beauty innovations, L’Oréal Skincare Expert/Paris invites every Filipina to unlock the secret to timeless beauty with REVITALIFT LASER X3. 1.) As early as 20s, natural aging already begins. Once women hit their 30’s, skin health processes slow down and the need to upgrade to anti-aging regimen becomes imperative. 2.) Sunscreen is one of most important anti-aging essentials. If you’re currently not wearing anti-aging product packed with SPF every day, now is the best time to start. The sun causes 90% of wrinkles with intense and frequent sun exposure lessening the ability of the skin to heal on its own. Preventing this by wearing sunscreen is easier than smoothing lines and other signs of aging later on. 3.) Address the neck, chest and backs of the hands as you would your face. These areas can give away your true age! Choose your cleansers carefully. Don’t use bar soap for facial cleansing, it causes skin to get very dry. 4.) Skin around the eyes is the most sensitive part of the face, it’s time to get serious about taking care of your eye area to prevent future crow’s feet. 5.) Reconsidering lifestyle choices such us giving up smoking cigarettes, limiting alcohol intake, and curbing how much processed sugar you intake. Achieving perfect skin is not complete without a proper and effective skincare regimen. Get that youthful glow with the no. 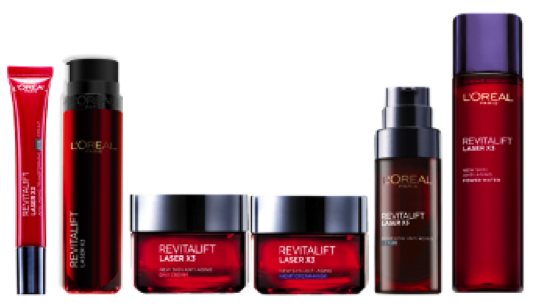 1 anti-aging line from L’Oréal Paris, Revitalift Laser X3. L’Oréal Paris’ Revitalift Laser X3 has triple anti-aging benefits that help refine pores, tighten skin and reduce dark spots. Infused with 3% Pro-Xylane LHA and Adenosine, it also replumps skin and corrects lines and with proper daily use, women get to prevent further signs of aging and thus, maintain youthful skin. It’s time to invest in a trusted anti-aging skincare with the Revitalift Laser X3 line: Day Cream (P1,499), Night Cream Mask (P1,499), Eye Cream (P995), Total Care (P1,499), Serum (P1,499) and Power Water (P499). Products available at all L’Oréal Paris counters nationwide.